As with any art, craft, or hobby, I like to keep a visual record of what I've made and how much I've improved. These candles have been sold, gifted, or used by me in the past. 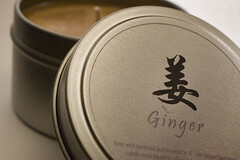 November 2008: This ginger tin was purchased from my Etsy store. November 2006: These hex votive jars have become favorite containers of mine. (White Shoulders & Hazelnut Eggnog) for Christmas. December 2003: I was proud of my ingenuity in sprinkling "nutmeg" on this Hazelnut Eggnog candle. December 2003: Another White Shoulders candle presented as a Christmas gift. of Amaretto sundaes was gifted to an amaretto-loving family.